Devotion to the Sacred Heart of Jesus is devotion to Jesus Christ Himself, but in the particular ways of meditating on his interior life and on His threefold love -- His divine love, His burning love that fed His human will, and His sensible love that affects His interior life. He will give them all the graces necessary in their state of life. He will establish peace in their homes. He will comfort them in all their afflictions. He will be their secure refuge during life, and above all, in death. He will bestow abundant blessings upon all their undertakings. Sinners will find in His Heart the source and infinite ocean of mercy. He will bless every place in which an image of His Heart is exposed and honored. He will give to priests the gift of touching the most hardened hearts. Those who shall promote this devotion shall have their names written in His Heart. In the excessive mercy of His Heart that His all-powerful love will grant to all those who receive Holy Communion on the First Fridays in nine consecutive months the grace of final perseverance; they shall not die in His disgrace, nor without receiving their sacraments. His divine Heart shall be their safe refuge in this last moment. First Fridays: going to Confession and receiving the Eucharist on the first Friday of each month for nine consecutive months. Many parishes will offer public First Friday devotions; if they do, you must perform First Fridays publicly. If it isn't so offered in your parish, you can do this privately, going to Confession, receiving the Eucharist, and offering your prayers for the intention of the Holy Father. Holy Hour: Eucharistic Adoration for one hour on Thursdays. Holy Hour can be made alone or as part of a group with formal prayers. My God and my Lord, Jesus Christ, in deepest humility I kneel before you and adore your Divine Heart. No one dares to doubt that you will grant all graces necessary to our salvation. Did you not say: "God alone is good," and are not you my very God? Is not your Heart the Heart of God who is all love? Therefore, there can be no power that is able to hinder you from granting our requests. Nothing is difficult for your omnipotence and your riches are infinite and can never be exhausted. No matter how often I may have sinned against you, I shall not despair because I know that you are God, infinite in generosity and mercy, always ready to pardon every contrite and humble sinner. I place my hope in you. Let me not be confounded, O Heart of my omnipotent God, have mercy on me. With the greatest confidence I come to you, the fatherly Heart of Jesus for I know that no father, were he ever so loving and solicitous, can possibly love his children as you have always loved me. To whom, therefore, shall I go if not to you the best of fathers and the author of all good? It is indeed true that I have grievously offended you, that I have neglected to honor you properly and have been guilty of ingratitude and do not deserve to be numbered among your children. But although I forgot my duty to you as your child I know that you are still my beloved Father in heaven. Now with a contrite heart I kneel at your feet weeping over my sins and promising you that in the future I shall make every effort never to offend you again. I hope in spite of my sinfulness to be received by you who have so often sought me. O sweetest Heart of Jesus help me with your grace so that I may carry out my resolution. Then, O Jesus, if my wishes are not contrary to your most holy will, I beg of you (mention your request) for which I pray with confidence and hope to receive from your infinite goodness. O beloved Jesus, my heart is deeply moved at the thought that you, Almighty God, should take upon yourself our human nature in order to enable you to become our brother and to make us children of God. But your loving Heart was not satisfied to raised us to such high dignity; you also desired to make us partakers in your inheritance in the kingdom of heaven. How greatly are we indebted to you for these favors. O how I grieve to think that until this very day I have been so ungrateful for your many gifts. Most humbly do I ask for your forgiveness and pray that you will through the merits of your Sacred Heart grant me the grace to follow you in all things so that at death your heavenly Father may find me worthy to be your brother in heaven. Furthermore, I beg of your most merciful Heart to have pity on me in my present need and grant me the favor (mention your request) that I hope to obtain from you. O I pray you to be my "strong defense." Be to me a "medicine for immortality." By kindly granting this request, you will unite my heart more closely with yours and make me forever grateful for your love. Do not permit my trust in you to be confounded, O eternally faithful, benevolent and sweet Heart of Jesus. O Divine Savior, the infinite love of your Sacred Heart was so inflamed for us that it brought you as a sacrifice of propitiation for our sins to the altar of the cross. still you love was not satisfied with this but permitted your heart and better understand your indescribable longing for our salvation. You have given us the wounded Heart and kept it open not only that we might find therein a protection against the justice of the Eternal Father whom we have offended by our sins but also that this source of grace and mercy may always be open to us in our needs. O Jesus, my divine model and teacher, what can I do when I see you the Son of the Eternal Father, full of glory and honor, laden with the cross, walking the awful road to death, especially when thereby you show me the way to salvation without selfishness but only for my benefit? O Jesus, what can I do but have faith in you and return your love by at least bearing my trials in patience and humility. And this, particularly, my God, because I have so often experienced the great power that my passions have over me, and how seldom I can withstand the temptations of the world. How hard do I not find it to deny myself the pleasure to mortify my desires and to renounce the false splendor of the world although I know full well that all these things so easily lead me into sin. O give me strength to resist my passions and close my eyes to the allurements and charms of the world, help me to imitate your poverty, purity and humility, and send me trials with the strength to bear them humbly. Though I fear them, they are necessary for me. But I wish to follow you and become like you. Therefore, permit me to drink all of your chalice of suffering. Heart of Jesus, burning for love of me, inflame my heart with love for you. Amen. O my Divine Savior, according to the words of the Holy Scriptures, you are in truth our advocate before your Father. You have freely taken this office upon yourself and unceasingly exercise it with faithful and loving zeal for all who trust in you. Your influence with the Father is so great he will not refuse you. He always hears you as you have testified at the grave of Lazarus. Filled with this faith and with confidence in your compassionate Heart I come to you to plead my cause. I have offended your Father and have called the anger of his Majesty upon myself. I am heavily indebted to his strict justice. I have nothing with which to pay the debt and therefore must fear the punishment. Besides all this, I am in the present need of (mention your request) where only the power of the Father can help me. For the salvation of my soul I sorely need this grace. My God and my Savior, Jesus Christ, I believe it to be an undeniable truth. I believe it firmly, O Jesus, that you are my good shepherd. Even if you had not said it, I would believe it because I know that you have in my behalf always manifested the heart of a good shepherd. Would that I, during my entire life, had permitted the goodness and solicitude of your Heart to lead me; would that I had never departed from your side, for then I would not have suffered so much misery and tribulation. But alas, I was untrue to you so often that in consequence I fell into the abyss of sin and was mortally wounded. Now, however, your straying lamb calls to you from the depths of its misery. O my good Shepherd, have mercy on me; give me proof again of your compassionate Heart. After all that you have thus far done for me I cannot believe that your Heart will reject me. Consequently, I beseech this Heart, I embrace it with confidence; and conjure you by all your merits that you obtain for me from your heavenly Father the forgiveness of my sins and the grace for a complete conversion. And then I also pray for the grace of (mention your request) which I am so much in need and which I hope to receive as the fruit of this novena. O Heart of the good Shepherd, have mercy on me. Amen. O adorable Savior, Jesus Christ, I believe what your holy Word teaches. I believe that you were made a priest forever by the solemn oath of your eternal Father and that you offer sacrifices forever. I believe that you offer the most sublime, holy and pure sacrifice most pleasing to God in the fire of your love, your Heart, your infinite merits, even your entire self. I believe that the most profound compassion of your priestly Heart impels you to carry on the function of your priesthood forever and ever in order to reconcile your Father with us and to offer him adoration, praise and thanksgiving for us as well to entreat him and grant us every needed grace. Inspired by this faith I come to you, O loving Jesus. I place all my needs with great confidence in your priestly Heart and upon the altar of your Heart. The eternal Father cannot refuse anything to such a priest and his sacrifice. Remember me then in all the Masses in which you offer yourself today throughout the world. Let your petition ascend from your Sacred Heart that the eternal Father may decide, through your merits, to forgive me all my sins which I detest from the bottom of my heart and in his fatherly love to grant me the grace for which I have so ardently pleaded during this novena (mention your request). O Sacred Heart, if the heavenly Father grants this request for your sake it will redound to your own glory because it will be a testimony to your Father's love for you. Procure this honor for yourself and from the sanctuary of heaven bring to me this desired grace so that my faith in you may be strengthened and my love of you may be more enkindled, O loving and priestly Heart of Jesus. Amen. Completion of the novena requires recitation of: Litany of the Sacred Heart; Act of R; Petition to the Sacred Heart; Prayer for the Souls in Purgatory. Lamb of God, You who take away the sins of the world, spare us, O Lord. Lamb of God, You who take away the sins of the world, graciously hear us, O Lord. Lamb of God, You who take away the sins of the world, have mercy on us. * Have mercy on us. Almighty and eternal God, look upon the Heart of Your most beloved Son and upon the praises and satisfaction which He offers You in the name of sinners; and to those who implore Your mercy do You of Your great goodness grant forgiveness in the Name of the same Jesus Christ, Your Son, Who with You lives and reigns world without end. Amen. O Heart of Jesus, whose overflowing charity for men is requited by so much forgetfulness, negligence and contempt, behold us prostrate before your altar, eager to repair by a special act of homage the cruel indifference and injuries to which your loving Heart is everywhere subject. Mindful, alas, that we ourselves have had a share in such great indignities, which we now deplore from the depths of our hearts, we humbly ask your pardon and declare our readiness to atone by voluntary expiation not only for our own personal offenses; but also for the sins of those who, straying far from the path of salvation, refuse in their obstinate infidelity to follow you, their Shepherd and Leader, or, renouncing the vows of their Baptism, have cast off the sweet yoke of your law. We are now resolved to expiate each and every deplorable outrage committed against you; we are determined to make amends for the manifold offenses against Christian modesty in unbecoming dress and behavior, for all the foul seductions laid to ensnare the feet of the innocent, for the frequent violation of Sundays and Holydays, and the shocking blasphemies uttered against you and your Saints. We wish also to make amends for the insults to which your Vicar on earth and your priests are subjected, for the profanation by conscious neglect or terrible acts of sacrilege, of the very Sacrament of your divine love; and lastly for the public crimes of nations, who resist the right and teaching authority of the Church which you have founded. Would, O Divine Jesus, we were able to wash away such abominations with our blood. We now offer, in reparation for these violations of your divine honor, the satisfaction you once made to your eternal Father on the Cross and which you continue to renew daily on our altars; we offer it in union with the acts of atonement of your Virgin Mother and all the saints and of the pious faithful on earth; and we sincerely promise to make recompense, as far as we can with the help of your grace, for all neglect of your great love and for the sins we and others have committed in the past. Henceforth, we will live a life of unwavering faith, of purity of conduct, of perfect observance of the precepts of the Gospel and especially that of charity. We promise to the best of our ability to prevent others from offending you and to bring as many as possible to follow you. O loving Jesus, through the intercession of the Blessed Virgin Mary, our model in reparation, deign to receive the voluntary offering we make of this act of expiation; and by the crowning gift of perseverance keep us faithful unto death in our duty and the allegiance we owe to you, so that we may one day come to that happy home, where you with the Father and the Holy Spirit live and reign, God, world without end. Amen. 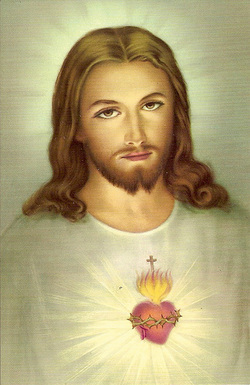 O Sacred Heart of Jesus, I have asked you for many favors but I plead for this one (mention your request). Take it, place it in your open, broken Heart, and when the Eternal Father sees it covered with the mantle of your most Precious Blood, he will not refuse it. It is not my prayer, but yours. O Sacred Heart of Jesus, I place all my trust in you. O Divine Heart of Jesus, grant, we beseech you, eternal rest to the souls in purgatory, the final grace to those who shall die today, true repentance to sinners, the light of faith to pagans and your blessing to me and mine. Amen. The month of June is devoted to the Sacred Heart.